Beoseon were fabric socks that kept the feet and ankles warm. The upturn toe was called Ko and the opening for the foot was called Buri. Depending on the sewing method, there were Hotbeoseon (unlined socks), Sombeoseon (paddes socks), Gyupbeoseon (lined socks), Nubibeoseon (quilted socks) and Taraebeoseon (children’s quilted socks). 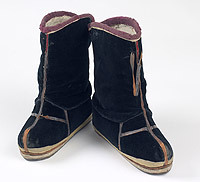 Shoes were not only used as foot coverings and decorations, but also as indicators of social class. The traditional Korean shoes were Hwa, which from the north and had long necks, and Li and Hye from the south with short necks. The materials and shapes of shoes differed depending on gender, class, job and costume. Hwaja were worn by civil and military officials in Joseon Period (1392 – 1910) along as part of their official garb. Its bottom was made of leather and its neck was made of thick cotton. Together with their officials costumes, Mokhwa were worn by civil and military officials on ceremonial occasions. 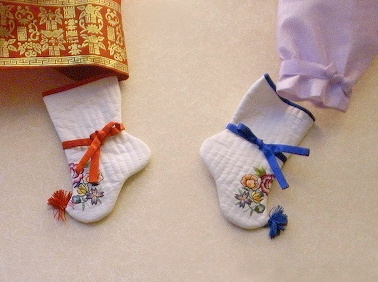 During the mid and late Joseon Dynasty, Mokhwa were worn by grooms as wedding shoes. These shoes were made of deerskin. Joseon scholars and military officials wore these leather shoes. Heukhye were initially undecorated, it was only in later times that strings were attached. The body of this shoe was covered with leather or silk and was worn by Joseon noblewomen. Some pairs had vine patterns carved on the toes and heels. These boot-shapes straw snow shoes were designed to keep warmth. Baekhwa were worn by scholars and military officials during the Joseon Dynasty at national funerals. They were made of white leather or white cloth with long necks. Taesahye were worn by Joseon noblemen and were covered with leather. They had carvings in strips on their toes and heels. These shoes were part of the noblewomen’s dress in Joseon period (1392 – 1910). They were made of leather with cloud motifs on their toes and heels. Jinsin were essentially leather rain boots. They were made with oiled leather for waterproofing and had clouts on their soles to prevent mud from splattering the wearer. 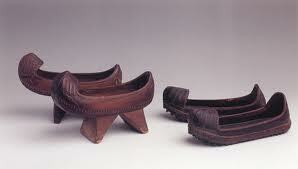 These wooden rain shoes were also called Mokyeokji, Mokyeok or Namu-sin. There were two kinds of Namaksin; one with heels and one without. The one with heels was worn on rainy days. 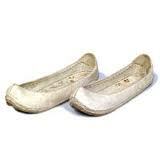 Jipsin referred to shoes made of straw. The name Mituri was originally used for roughly made hemp-cord shoes. The name was later used to refer to the finely woven grass shoes of the late Joseon period (1392 – 1910). 1. Hong Jinkee, Lee Donghae, Kang Hyejeong, Pyo Seongleon, Korean Clothing, Korean Cultural Heritage 2, pg 120 - 160, Retrieve April 25, 2013.